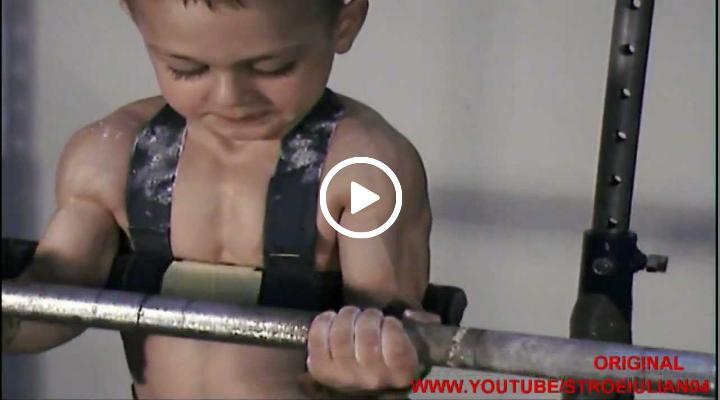 Worlds Strongest Kid Giuliano Stroe. Giuliano Stroe shows off his muscles and tricks at his home gym. 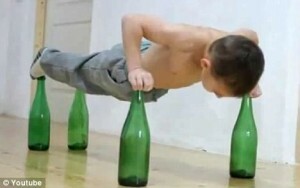 The boy, just 6 years old, trains intensively for hours each day with his father Lulian, age 35. Lulian is determined to turn his son into a star. He is already known for his strength and agility, doing tricks that many adult athletes would find impossible. Giuliano was entered into the Guinness Book of World Records when he was 5 years old for the fastest 10m hand walking. Giuliano has been working out since he was 2 years old and is now a bodybuilder. His training routine includes two hours of heavy lifting every morning. He is incredibly strong and holds the world record for 90 degree vehicle push ups and the human flag. Whether it’s normal or healthy for his father to be putting him through the routines is another debate entirely, especially when he apparently admits he hopes his son becomes a star. But it’s still amazing to marvel what he is capable of accomplishing.